On Thursday 20th May, an anti-arms-trade activist will stand trial at Nottingham Magistrates’ Court. Kirk Jackson is pleading not guilty to a charge of aggravated trespass for his part in a protest that closed the international sales office of arms company Heckler & Koch for a day. 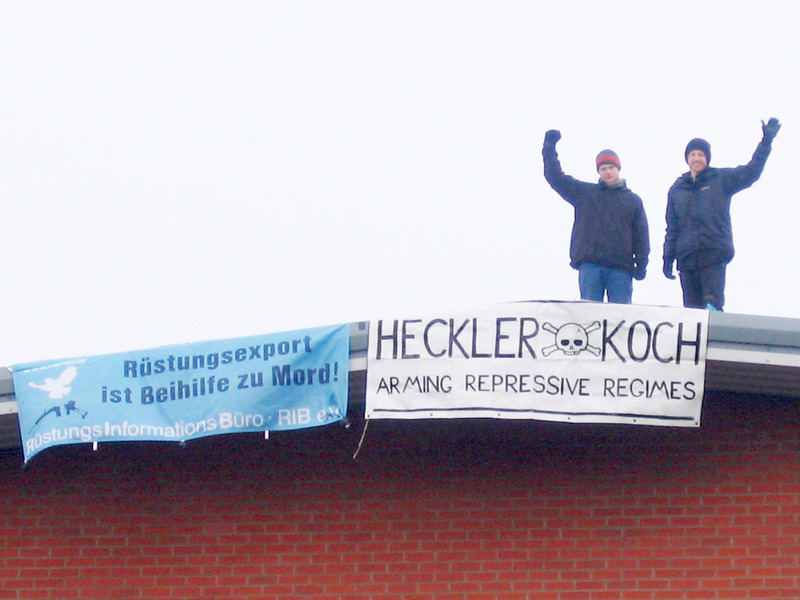 On 18th Feburary, Jackson and another local activist climbed onto the roof of Heckler & Koch’s unmarked warehouse in the Lenton Lane industrial estate and unfurled banners accusing the company of “arming repressive regimes”. There will be a planting day on Friday 4th June and the organisers are asking for gardeners and volunteers to come along and help out between 10:00 and 15:00. Tools will be provided, but volunteers should bring their own lunch and drink. For more information, contact Giselle on +447948771168. 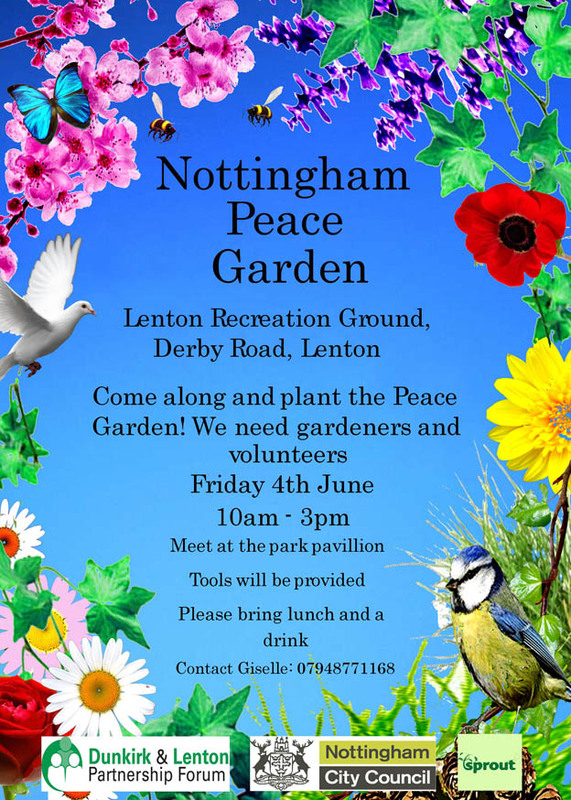 According to Lynne Richardson from Nottingham Quakers, “There are talks of using the venue for a Peace Festival… so it should be a good focus for peace work in Nottingham.” The Peace Garden will be situated just 1km from Nottingham’s largest arms company, Heckler & Koch. The six activists who blockaded the Nottingham-based arms company Heckler & Koch appeared at Nottingham Magistrate’s Court on March 17th and 18th on charges of aggravated trespass. Five pleaded guilty and were ordered to pay between £40 and £195 each in costs and fines. The two with prior convictions were also served with 12-month restraining orders preventing them from entering Easter Park, the industrial park in which Heckler & Koch’s warehouse is situated. The sixth activist pleaded not guilty. His trial will take place at Nottingham Magistrates’ Court on Thursday May 20th at 09:45. The arms company’s Managing Director will be called as a witness. A bail condition preventing the activists from associating with each other was lifted. The latest film by Jean-Pierre Jeunet, director of Amélie, is a wacky caper about a group of oddball characters who decide to take direct action against the arms trade. 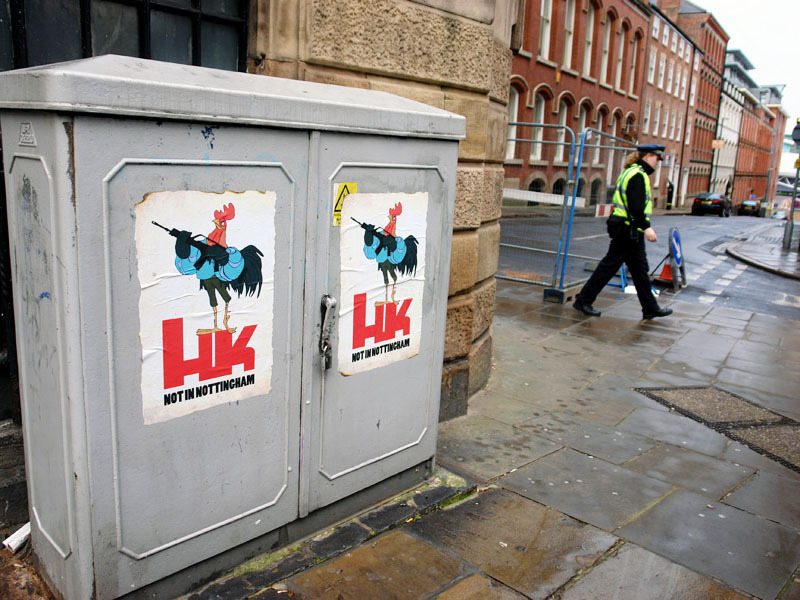 In it, the products of one Nottingham-based arms company – Heckler & Koch – make a brief appearance. 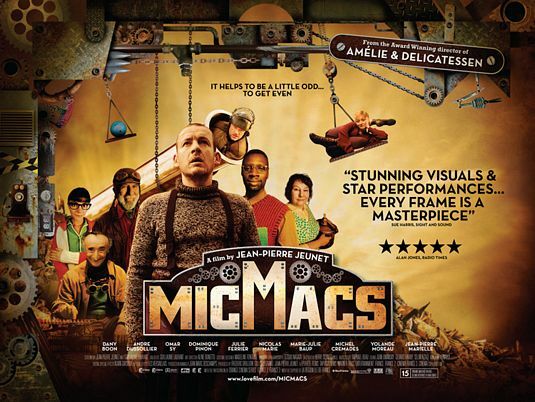 Micmacs follows the fortunes of hapless video store clerk Bazil, who decides to take revenge on two arms companies – one that made the landmine that killed his father, and the other that made the bullet that nearly killed him. The international sales office of arms manufacturer Heckler & Koch was shut down on Thursday 18th February by anti-arms-trade activists. 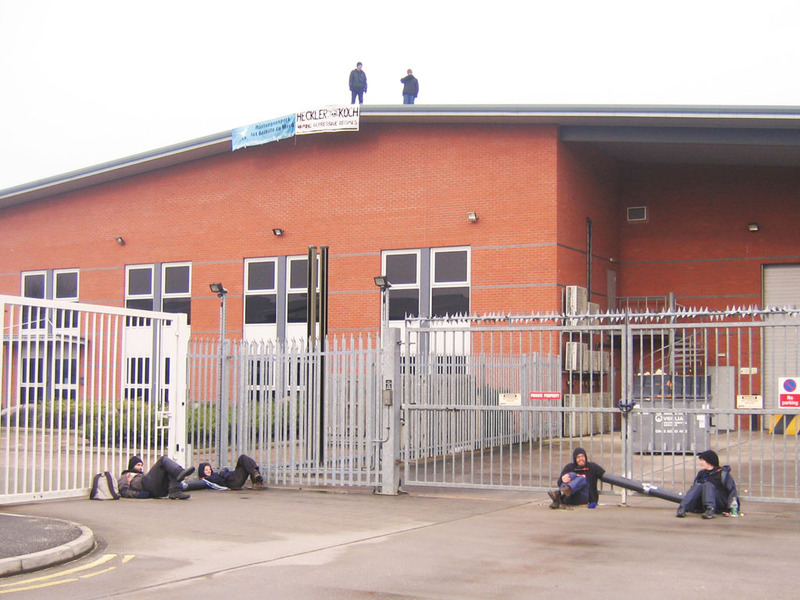 The six activists arrived at H&K’s Nottingham warehouse building before any employees turned up. Using D-locks and arm-tubes, one pair locked themselves to the staff entrance while another pair blockaded the goods gate. Meanwhile the other two gained access to the roof and hung anti-arms-trade banners on the front of the building. HK - Not in Nottingham! The poster features a picture of the rooster troubadour Alan-a-Dale from Disney’s animated Robin Hood film, but instead of holding his traditional lute, he is holding a Heckler & Koch assault rifle. He stands atop the red HK logo, under which are the words “NOT IN NOTTINGHAM” (the refrain of a lament that he sings in the film). In America, Britain and the other imperialist countries there has been widespread public opposition to the attacks on Afghanistan and Iraq. Since 2001 millions of people have at some time or other publicly expressed their dissent from the aggressive wars being waged by the imperialist states. Yet there has been little criticism of or attempts to influence the armed forces actually carrying out these military operations. 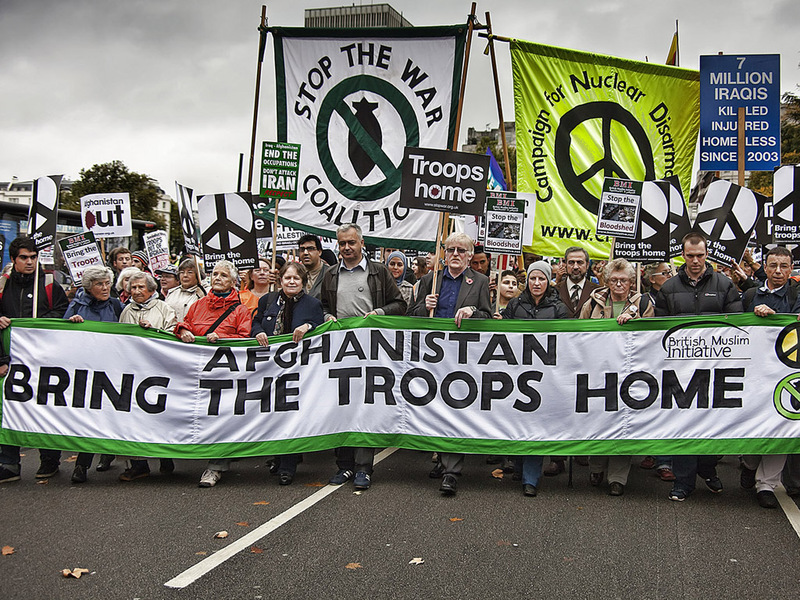 In Britain the Stop the War Coalition has avoided criticising the British armed forces. It presents them as the innocent tools of the British Government with no culpability for the death and destruction they are causing. The Military Families Against the War wing of Stop the War has actually complained that British troops are getting injured and killed because they are not better equipped. They complain that British military personnel have been injured and killed because they are used to fight illegal and unnecessary wars. But they do not have much to say about all the Iraqis and Afghanis killed and injured by British forces. In general the anti-war movement in Britain has kept away from the armed forces and has not tried to directly influence them. This is a serious error because disaffection among the military would seriously undermine the capability of the British state to wage its imperialist wars.